January 16, 2013 - As a result of an in-flight, Boeing 787 battery incident earlier today in Japan, the FAA will issue an emergency airworthiness directive (AD) to address a potential battery fire risk in the 787 and require operators to temporarily cease operations. Before further flight, operators of U.S. registered, Boeing 787 aircraft must demonstrate to the Federal Aviation Administration (FAA) that the batteries are safe. The in-flight Japanese battery incident followed an earlier 787 battery incident that occurred on the ground in Boston on January 7, 2013. The AD is prompted by this second incident involving a lithium ion battery. 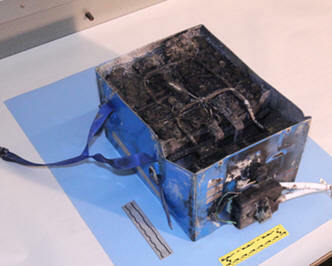 The battery failures resulted in release of flammable electrolytes, heat damage, and smoke on two Model 787 airplanes. The root cause of these failures is currently under investigation. These conditions, if not corrected, could result in damage to critical systems and structures, and the potential for fire in the electrical compartment.